An overjoyed family have been reunited with their dog eight months after she went missing in a remote forest. Nervous American Bulldog Izzy slipped out of her collar and disappeared in woodland after being spooked on a country walk. 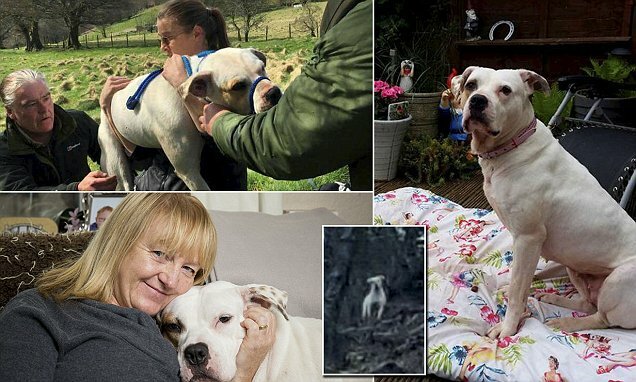 Her owners Carol O'Neil and partner Gerry Clarke spent hours frantically looking for the rescue dog in vain before returning home heartbroken. The devoted pair spent all their spare time over the next eight months searching - walking miles through the Welsh wilderness in all weathers. A ten-strong team of dog-lovers, many of them strangers, joined the quest as they announced searches through social media. 'Team Izzy' scoured the countryside around Cwmcarn Forest near Newport, Gwent, where she vanished and weeks later spotted Izzy in the distance. But Izzy, who was rescued from a cruel puppy farm shortly before she disappeared, ran off scared. The couple set up a 6' x 5' deer cage with food left in it and a pad-activated trap was set. But somehow Izzy managed to get the food without activating the trap. After five months the couple heard from a farmer who said Izzy had made friends with his smaller dog and was regularly coming onto his land. But it took another three months before they finally managed to catch her - after enlisting a marksman to shoot her with a tranquiliser dart. Carol, 55, and Gerry, 53, called in the trained marksman when other local farmers threatened to shoot Izzy to protect their livestock. She was found four miles from her home in Wattsville, near Newport - where she is now slowly getting used to human contact again. Ms O'Neil said: 'People have been amazing. I just can't believe it. 'I've had people out searching with me in rain, in snow and in mud - and almost all of them I didn't know before Izzy went missing.